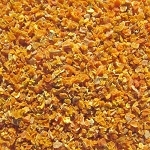 These tender dehydrated butternut squash dices are a great addition to your meals. All our dried veggies have No additives or preservatives, are Non-GMO, Gluten Free, and Kosher OU. The dried butternut squash is waiting to be added to your pantry and to your favorite dish. Dehydrated butternut squash is convenient to take on the trail since it doesn't need to be refrigerated, is lightweight, doesn't take up much space, is easy to store, last for months, and is tasty! We guarantee quality, nutritious, products. Our butternut squash is perfect for an addition to a tasty recipe, a quick energy snack, and it is a healthy, nutritious choice. The slow, air drying process preserves the nutrition of butternut squash while evaporating the water. In fact, of all the food processing techniques available, dehydrated products maintain more of their nutrition than their frozen or canned counterparts. You can enjoy a quick, easy meal with our butternut squash. When carefully sealed and stored away from moisture, our dried butternut squash has a shelf life that will last for two years or even longer. If you live in a dry climate, the shelf-life can be extended. Because of the quality and long shelf-life of our dehydrated foods, you may find that they are not only an excellent source for everyday use, but they are also a smart product to store for emergency preparedness. Dried butternut squash is perfect for both your home, camping trips, or for hiking the trail.